It is always surprising to find something where you don't expect it, expecially when it is a cascade this large two hours south of the mountains. 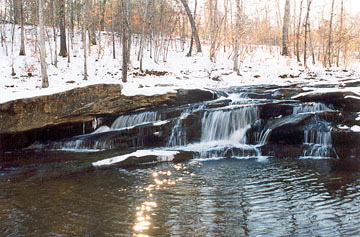 Horseshoe Falls (aka Gordons Mill Falls) are on Cedar Shoals Creek just northeast of where the creek joins the Enoree River. The 10-foot high falls have always been a popular picnic area and swimming hole for locals (read: party spot). They are now a part of the Musgrove Mill State Historic Site. This park, currently being developed, marks the location of an important Revolutionary War battle fought August 19-20, 1780. According to the S.C. Department of Parks, Recreation and Tourism: During the summer of 1780, Enoree River landowner, attorney and mill owner Edward Musgrove allow British Loyalists to use his property as a hospital. According to legend, his daughter Mary Musgrove helped a Patriot blacksmith Gailbreth Robinson (sometimes recorded as James Robertson) hide from these Loyalist troops in the cavern to the left of these falls. Robinson, nicknamed Horseshoe for his occupation, was brought food and information daily about the Loyalists' activities by Mary. This information led to a plan of attack for the Patriots. Later, the falls were named in Robinson's honor. Quoting from SCPRT: "Although they were outnumbered two to one, the Patriots surprised and routed a group of Tories and a few British regulars, inflicting heavy losses during the two-day fight. Occurring at a time when American prospects for winning the Revolution seemed to grow dimmer by the day, the success at Musgrove Mill bolstered patriot morale in the North and South Carolina backcountry. The battle is also significant because, with the exception of a few British officers, all of the soldiers who fought on both sides were Americans. In this respect, the battle of Musgrove Mill illustrates the fact that the Revolutionary War was also a civil war, which often pitted patriots against their loyalist neighbors." A put-in and take-out point for canoes and kayaks on the Enoree River is a short distance down the road from the falls on the left. 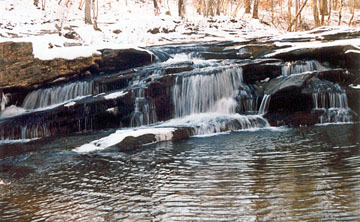 There are a number of small cascades on the Enoree to view as well as the remnants of the Jones Bridge that connected Horseshoe Falls Road and Barrel Stave Road. Directions: From Exit 52 of I-26, take Hwy. 56 north toward Cross Anchor. Cross the Enoree River and go approximately one mile up the hill. Take a left onto Horseshoe Falls Road. 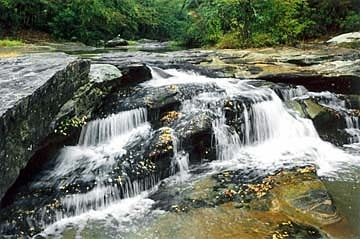 Horseshoe Falls will be on the left immediately after crossing Cedar Shoals Creek on an old iron trussel bridge. Park at the vehicle barricades on the left beside the bridge or on the left at the top of the hill.